This was supposed to go into the first issue of New Beginnings our family e-newsletter. It was a suggested article by our cousin Nicki to do a story about our grandparents. I thought to myself this should be easy. I have written so much about our family I was sure I could just use an old writing from my blog. I searched and searched and low and behold there is not a story written specifically about them. I never knew my grandparents personally, but the research has allowed me to chronicle their steps from birth through their death. 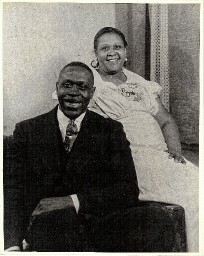 In December of 1913 Jefferson Davis Yeldell (age 19) married Annie Mae Senior (age 15) at Springfield Baptist Church in Edgefield SC. If they knew then what we know now do you think it would have made a difference? I would like to hope that it wouldn’t. The story says they met at church. They lived in the time of circuit preachers. What are circuit preachers? Traveled from church to church to spread the word. So it is said that granddaddy traveled to a different church each Sunday to receive the word of GOD. One Sunday they went to Springfield and he met Annie. Well I am not too sure that was the way they met. Granddaddy lived in Greenwood while Grandma lived in the city of Edgefield. They both however lived in the same county which was you guessed it Edgefield County, SC. The county was split up in to townships. Townships are made up of 36 sections each measuring one square mile. 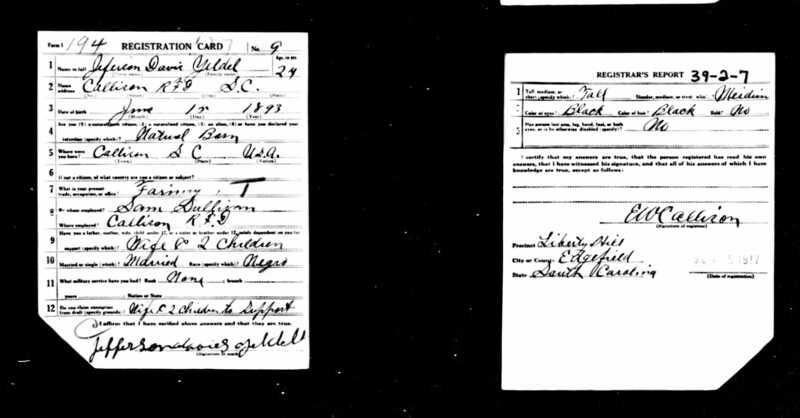 The 1910 Census states that both granddaddy and grandma lived in the same township called Blocker. Given the area they did not live that far apart. They could have met in the neighborhood or even went to the same school. No matter where they met their union created a legacy that should never be forgotten. like us they lived around each other, worked together, went to school together, played together and just simply hung out. The census says that Granddaddy lived in Richmond for a time. My mother says that he traveled a lot for a year so I am guessing this was the time he did the traveling. In spite of the travel they found time to get pregnant again. So in 1926 his address was 1711½ Venable Street, Richmond VA, while grandma was living in at 90 Mountain Street, Asheville, NC. During this time Uncle Dave was born. For whatever reason they did not stay in Asheville long and they moved to DC. I don’t know if grandma was pregnant with Uncle Rob when they moved to DC or not but he was the first of the second set of children to be born where we all call home. She did another 18 months to Two year trick with the children and by 1939 the entire set was born. Did you know that Aunt Josephine was a twin? Some say the twin lived a little while and even had a name, while others say the baby was stillborn. 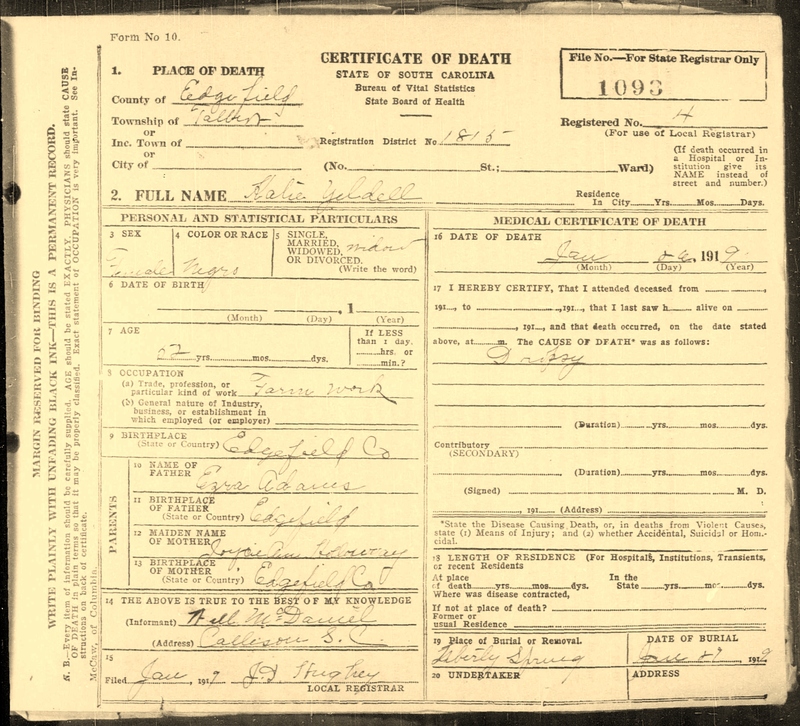 Well I have records from the “District of Columbia Deaths and Burials, 1840-1964” that states the baby was stillborn and she was not given a name. After Aunt Josie and her twin but during the pregnancy with my mom (Aunt Juanita) the start of grandchildren had begun. There were five grandchildren before my mom was born. 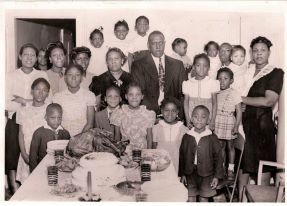 The grands were from Uncle John, Aunt Lula, Aunt Sis and Mama Nell. Uncle John had a son, Aunt Lula had a son, Aunt Sis had a boy and a girl and Mama Nell had a set of twins. Her twins died before my mother was born. Then my mother was born and around the same time two of her daughters had three more children Morris a.k.a Maurice, James a.k.a Monkey and Edna. By 1940 they had birthed all of their children and had 6 grandchildren three of those six were older than their aunt by one year. Realizing this made me think of the Thanksgiving picture of our grandparents, their daughters, one son and their grandchildren. If we ever wanted to date it we could. Barbara Ann was the baby being held by the lady to the right in the picture and she was born in 1943. Looking at the picture she could not have been more than one or two years old so this picture was taken in 1944 or 1945. With all of these children they still found time to found a church. In November of 1939 they decided to bring the church that we were told brought them together to Washington DC. Yes they made their own Springfield right here. They nurtured that church just like they did their children and 73 years later it is still in existence. When my mother spoke at the honoring of her mom at the Springfield of DC she spoke about how great her mother was. She was chairwoman of the Deaconess Board and Founder and President of the Women’s Auxiliary Club, Pastor’s Aid club, the Nursing Unit and the kitchen committee. In 1950, our grandmother passed. She left behind a loving husband 6 sons, 7 daughters and 18 grandchildren. Granddaddy remarried before the year was out and continued to take care of his family the best he could. He kept the church afloat and in 1964 he was called home to be with the Lord. Both of them were eulogized here in DC but their bodies were sent back to Edgefield and fittingly buried in the cemetery of the church where they began. We can only guess at how they met or how long they courted before Jeff popped the question. But had he not done that we would not be where we are today. Right now they have over 400 hundred offspring. For every beginning there is an end. Because of the size of our family the end is nowhere in sight.